See the best gaming chairs in one place right here – why not read our in-depth guide to find the best chair right now? Based on our research, we current​ly recommend the Secretlab Omega from Secretlab.co for the best choice overall. We are here to direct you towards the best products on the market and can help you save money whilst helping you enjoy the comfort and efficiency you deserve. We can direct you to stylish gaming furniture for tall, short, big and small people, providing you with impartial reviews from experienced male and female PRO gamers to help you make sense of the market. There are many great reasons for investing in the most comfortable gaming chair available to you. If you’re the kind of person that enjoys lengthy gaming sessions well into the small hours, we can help you find highly ergonomic products that will help you avoid back pains, neck pains, headaches, fatigue and other unpleasant conditions. Don’t risk your health or compromise the quality of your gaming endeavours – get the best seat and desk for your needs and enhance your enjoyment. Why not dive in right now! From DX Racer Chairs, the FD01/NE Racing Bucket Seat Office Chair looks to continue the trend of affordable luxury in the realm of gaming, watching TV, and even while working. It’s slick design and low comparable cost makes it instantly recognizable. Having learned from previous models, the DX Racer FD01/NE is more comfortable and efficient with space, creating a lightweight and free looking design. An extended backrest is included to help cushion your neck and spine while special soft armrests help to protect wrists and shoulders. Another in a long line of chairs made by X Rocker, the 51396 Pro Series represents a continuation of the quality, thoughtfulness, and usability that have made other chairs by this manufacturer so popular. 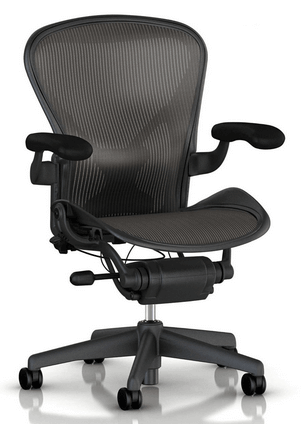 The X Rocker 51396 Pro Series provides an ﻿﻿﻿﻿﻿﻿ergonomic﻿﻿﻿﻿﻿﻿design that works incredibly well for a range of heights and sizes. The built-in radio wireless receiver comes with a wireless transmitter that can work with any source around the house. RCA stereo outputs and optional RCA cables are also included. Included in the chair are two speakers as well as a sub-woofer that utilize 2.1 AFM technology to create a truly immersive sound experience. Along with the ability to connect multiple game chairs. 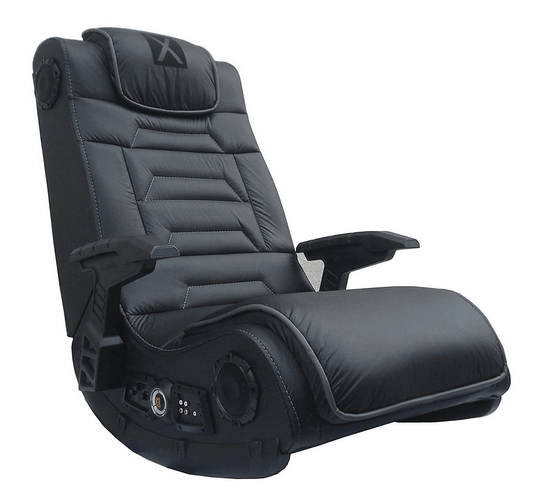 The X Rocker 51396 gaming chair separates itself from the crowd by being excellent at watching TV on, reading, listening to music, and of course, playing computer games. ​Check the Top 15 XRocker Chairs for Gaming Now! The Clutch Throttle is a relatively newish chair designed by the company Clutch Chair. They’re not well known in the industry, so we wanted to explore their products and see what they had to offer. They do offer an extensive line of different colors but the overall design of the chair didn’t seem too impressive on first glance. It was like a watered-down version of the DXRacer in terms of design but how does the clutch throttle chair hold up in performance and comfort? The comfort level of the chair is phenomenal. The padding on the base of the chair where you sit your rear end on is relatively comfortable and quite impressive. It’s also a nice wide base so heavier people can enjoy the chair. It comes standard with a lumbar support pillow for that extra layer of support and comfort. The comfort level of the chair is quite impressive as it should be with the high price tag of the chair compared to some of the others on the market. The neck and spinal support are also impressive with the high rise comfortable neck padding. The armrests were surprisingly comfortable as well, they were pleasant to rest our wrists on and they were far enough apart that if you needed to use them, you wouldn’t feel cramped thanks to the wide base. The material of the chair is nice and it’s a breathable vinyl exterior. It comes in a wide assortment of colors and red was our favourite. For those of you looking for a strong, comfortable and reliable chair but you don’t really have the budget to go all out on some expensive multi hundred-dollar chair, there’s the Homall Executive Swivel Leather Chair, Racing Style High-back Office Chair With Lumbar Support and Headrest. This is rated as one of the top-selling chairs of its type on the internet and is one of the most economical/budget-friendly chairs out on the market as well. It comes in different colors but we decided to look at the white and blue chair. There’s no real difference between the chairs if you decide to get a different color, it’s just aesthetics. The wheels on the base caught our attention first. They’re a nice stylish touch and the hubcaps look like mini-racing wheels. The lumbar cushion on this chair is extra-large and super soft to the touch. It fits nicely when you lean back or if you’re sitting up and just need that added extra layer of support. The wide stance of the base on the chair allows for people of up to 300 pounds to sit in the chair and relax comfortable and it’s also great for anyone who’s 6 feet or taller. The wheels don’t make a lot of noise on the floor and have a nice smooth rolling transition. The softness of the cushion on the seat is wonderful and sinks in really well with great return form. Homall is a great company and offers really good support on all their products, so if you have any problems with the chair, they’ll quickly resolve it. 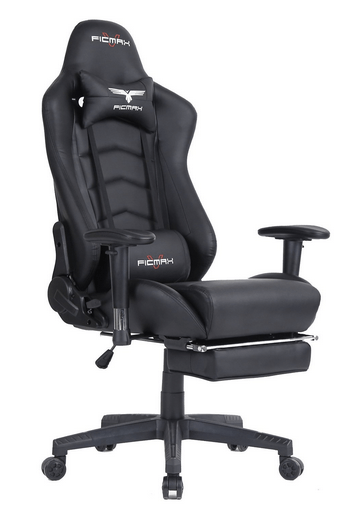 The Ficmax Ergonomic High-back Large Size Office Desk Chair Swivel Black PC gaming Chair with Lumbar Massage Support and Retractable Footrest is a sleek stylish budget friendly chair that still has the same unique stand-alone features that the DXRacer line of gamer chairs has but it doesn’t cost nearly as much. We decided to look at this chair because it’s one of the top-selling mid-range games/PC chairs of all time and it’s highly reviewed by real customers on the internet. The durability and comfort of the chair stand out first and foremost. The heavy-duty metal frame supports weight up to 300 pounds and the thick padding attached to the base makes it a very comfortable experience. The cosmetics of the chair while they add no real benefit to your comfort, are still a nice and unique touch. The straps in the background that range from the neck cushion pillow all the way down to the lumbar support are a nice touch and we liked the shape of the neck cushion pillow. Most of these pillows come in a very flat square shape but the curve on this chair allows you to relax even more. The chair comes with a very wide base, so if you’re a heavier gamer or a relatively tall person, you’ll have no trouble making yourself comfortable or worrying if the chair can support you. The chair has a wide range of flexibility and allows you to lean back to a complete 180 degrees. The customer support offered by Ficmax is excellent as well, they have a great warranty and product replacement plan. Cohesion offers supreme comfort, coupled with a definitive, immersive gaming experience. The Cohesion XP 2.1 Chair with Audio is ideal for any room in the house, and emphasizes a chair that is both lightweight and comfortable. Cohesion XP 2.1 features 2 wired receiver audio speakers, volume control, and in-and-out headphone jacks. This chair is built for long, intensive gaming sessions. If you’re the kind of person who plans to sit and play for a considerable stretch of time, you’re going to love how easy this chair makes things for you. The audio quality for the Cohesion is definitely impressive, as well, offering full, rich sound. 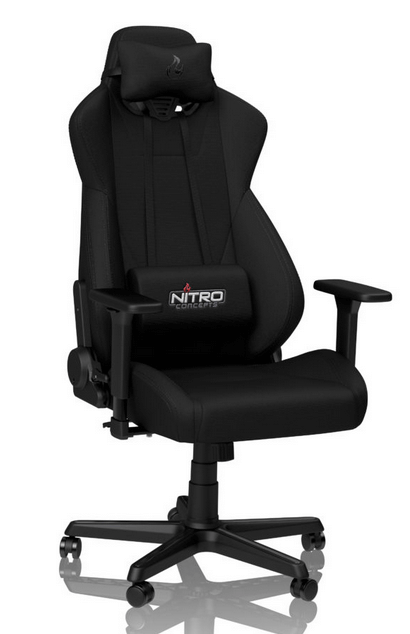 The Nitro Concept S300 Stealth Black ergonomic Office Gamer Chair enters the fray with a unique style and an adaptable backrest type of design that’s lean and comfortable. The logo is proudly displayed on the lumbar pillow and the headrest pillow as well, so what can you expect out of these chairs and what kind of quality are you in for? We’ll admit, we don’t know an awful a lot about Nitro as a company or their chairs so we had to do a little digging into every single feature and material used in the chair to get more information. So aside from the design, what else does this chair have to offer to help up the pricing point and help sell the point of the chair? We like the powered gas lift that comes in the base of the chair. It’s like a smooth hydraulic motion when the lift is moving. It’s pretty adaptable and we found that the height adjustment is pretty solid as well, so you can adjust it for a high sitting desk or you can adjust it for a low sitting desk all the same. As with many X Rocker chairs, the 51498 Pulse 2.1 Sound Chair takes the idea of comfort and luxury and adds a twist that makes it all better. Placed on the ground, the rocker seat holds itself in place and eliminates the risk of falling backwards through its design. Built into the X Rocker 51498 are two speakers as well as a sub-woofer. These expand your immersion by making the game come to life as you are placed right into the heart of the action. The RCA outputs allow you to play music from any source with 2.1 sound immersion. Along with bringing better music quality directly to you the X Rocker 51498 is incredibly comfortable with its padded headrest and ergonomic design. Altogether, you are left with a chair that is fantastic for games, great for listening to music through, and comfortable for watching TV, reading, or relaxing. The X Rocker 5172601 is an updated model designed to improve on early rockers released by this company. The simple rocker design and colouring makes the X Rocker 5172601 stylish while its ergonomic design with backrest helps to make it comfortable for long hours of gaming. stands apart with its built-in Bluetooth reader, making it simple to connect with other Bluetooth devices. Along with everything already said, an additional RCA cable is provided. Whether you decide to game, read, or watch movies, the X Rocker 5172601 improves the experience and provides excellent comfort. The Arozzi Enzo game chair is a unique combination of sleek comfort, style, and great looks. It has an ergonomic design that gives you the right posture when playing your favorite games or watching your favorite sport. 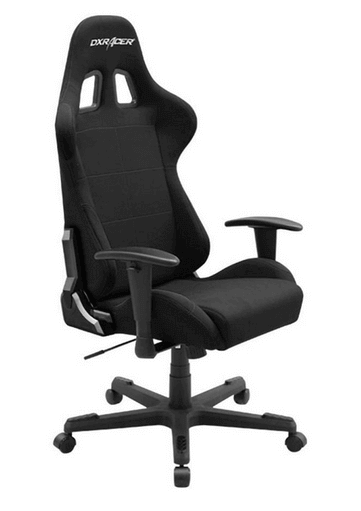 You can easily transition from work to playing video games on your PC with this chair. It has a 360-degree swivel and an adjustable gas spring. Its light weight (37.5 pounds) makes it easy to move the chair from one location to another. The Arozzi Enzo has thick padding on its backrest, seat and armrest that gives your maximum comfort for extended gaming hours. You do not have to worry about cleaning the swivel chair. It is made of UP leather that is not only comfortable to sit on but also easy to clean and maintain. You can tilt the seat for more comfort and use its lock function for stability. The lock function works in its upright position. The swivel chair has five high strength nylon wheels that guarantee your stability and safety even in intense gaming moments. The chair comes in black and blue colours. The unique features, sleek comfort, warranty, cool colours, and considerably low price make the Arozzi Enzo chairs a best seller​. The Cagliari by Turismo Racing is a patented racing seat built to keep you comfortable for more than eight hours of intense gaming. It has an ergonomic design with extra foam padding on its seat and backrest for maximum support and comfort. The Cagliari is your best choice for extended gaming hours. It has a high straight backrest with an in-built angle adjuster. A high backrest allows you to rest your neck and support your spinal cord. This feature is rare in many gaming and office chairs. The Cagliari has adjustable armrests that protect you from kyphosis and ensure that you do not hurt your shoulders while working or playing. Its wide pad enables you to use the mouse for long hours without hurting your arm. Additional features that make the Cagliari popular include an integrated headrest pillow, footrests in its Aluminum base, unique tilt mechanism, and lumbar cushioning. You can adjust this chair to suit your desk or gaming station. Turismo Racing guarantees the safety of its client by with a star-shaped iron base. The strong base enables you to move the seat safely around your home or office. In addition, you get a 24-month warranty on all parts and a lifetime warranty on the chair’s frame. The red and black Cagliari is a rare representation of modern design, maximum support, comfort, stability. Switching from watching to the TV to playing music or videos games is now easy with this rocker chair. 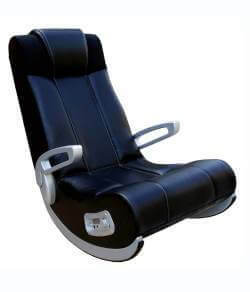 The chair is compatible with PlayStation, Wii, Nintendo, Xbox, Gameboy, MP3, and DVD. 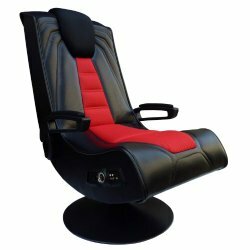 You can sit all day, enjoy all your favorite programs, and listen to music on this chair without hurting your back, this chair is a must for an Adult Gamer. ​Its ergonomic design gives you full back support. You have a side control panel where you can adjust the volume and bass of your music. X rocker 5127401 pedestal chair comes with an inbuilt 2.1 sound system that has a sub-woofer and two speakers. You will experience great sound like never before whether you are watching a movie or enjoying your favorite tunes. You will enjoy wireless audio transmission and can listen to music using your headphones. The X Rocker 5127401 Pedestal is your best pick if listening to quality music while playing videos games is the perfect way of enjoying your leisure time. You can enhance your comfort while playing using the chair’s tilts and swivels. The rocker chair will not take all the space available in the living room. It has a fold-able design that allows you to move it to any location. Its upholstery vinyl cover is durable and easy to clean. You are guaranteed to use this seat for a long time without thinking of replacing it. The chair is black in color with silver flip up arms and weighs approximately 47 pounds. Few gaming chairs combine elegance with amazing gaming technology but this rocker chair gives you that combination and more. It has a black elegant cover on its body and silver plastic arms. The rocker has black wireless rails and quality speakers to give the best sound when playing your video games. You can connect this chair to any MP3, DVD or CD and listen to your favorite songs. The seat is also compatible with most models of home theaters and iPod. It has a side control panel where you can adjust the volume and bass of the speakers. ​While you can watch movies and play music as you relax on this seat, your main aim is to enjoy your favorite games comfortably. X rocker 5127301 is compatible with Wii, Xbox, and PlayStation. Other amazing gaming features on this rocker are input and output jacks and sub-woofers with a quality audio output. One consideration every gamer must make when shopping for a gaming seat is its material. Some chairs for gaming have attractive features but are hard to maintain. The rocker chair has an easy to clean cover and is easy to store. Getting the right sitting position when playing video games is important to avoid back pains. 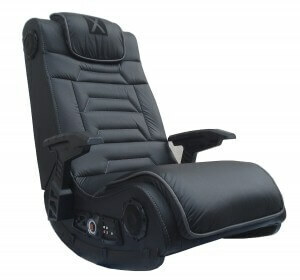 This rocker chair is very comfortable and helps get the right posture especially for intense video gaming. The chair has a modern sleek design with blue and black vinyl cover. It has an aluminium finish on the control panel and speakers. ​Modern gaming chairs allow you to switch from one activity to another. With the in-speakers and control panel on this rocker chair, you can listen to music while on break from playing games. Its compatibility with home theaters, MP3, CD, and DVD allows you to watch movies on the most comfortable seat. You no longer have to watch movies on the couch. 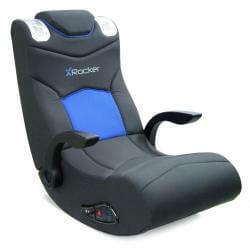 ​X Rocker Game Chair 5141701 is compatible with most gaming consoles include PSP, Wii, Xbox and PlayStation. Music lovers will not only the comfort and design of this rocker but its quality music output. You can balance the bass and volume from the control panel and get the clear sound on your headphones. The seat is very convenient if you have limited space in your living or gaming room. You can fold its parts in half and store them. The fold-able construction and weight of 51 pounds make this rocker chair easy to move from location to another. 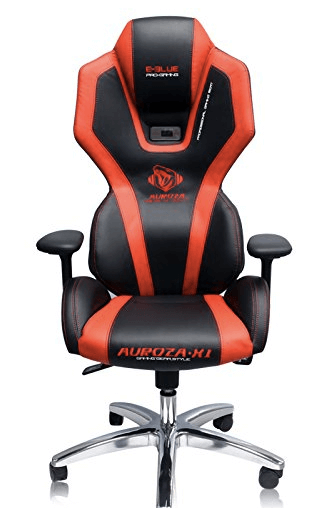 While this is one of the lesser known companies of the gaming furniture world, AKRACING puts out some pretty high quality and decent products at fair and reasonable prices. One of them is the AKRACING AK-7018 Ergonomic Series Gaming Chair. 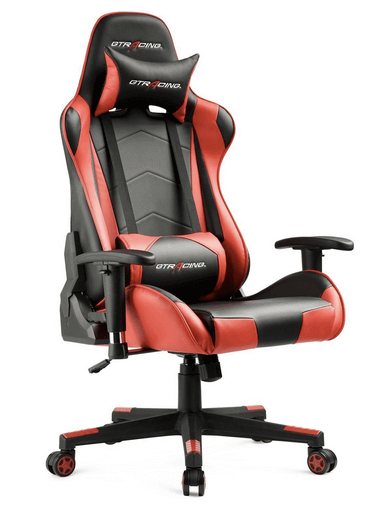 The chair has a unique style to it that you can also find on other racing chairs like the famous lineup of DXRacers and it comes in a sleek red and black style or design. One of the first things you’ll notice is that the armrests are positioned originally a bit lower than you’re used to on most racing chairs. Luckily, you’re able to adjust the armrests to your liking as desks come in at different heights. What about people who like to lean back and want to lounge? The backrest allows you to tilt up to 180 degrees, easily allowing you to rest as you like if you’re watching a movie or even if you want to sleep in the chair. One of the best redeeming qualities is the metal frame construction, which allows heavier people to sit in the chair and it won’t break on you. This gaming chair will support up to 400 pounds, so you’re safe. Don’t like the height position of the chair? This is easily adjustable via a lever on the right of the chair. The item weight, however, is around 50 pounds, so while the metal frame construction is handy for support, it can seem like a bit much for some people to move around. One of the best things about the Kinsal lineup of chairs is that they support a wide variety of customers with some of their unique designs. The Kinsal Ergonomic Leather High-back Swivel Chair with Headrest and Lumbar Support is built sturdy and with a wide frame so that it allows heavy people to enjoy the seat as well, unlike some chairs that only provide support for teenagers and smaller people. If the original version still isn’t enough, you can even upgrade to what’s called the big and large version of the chair which comes taller and with a wider frame. This chair comes with a very high back which is nice and padded for extra lumbar support. If you have a problem with the armrests, they are fully adjustable to your standards and your liking. The height of the chair is also adjustable as well depending on your computer desk with a gas spring system. If you’d like to tilt or lean back, the chair can tilt up to 180 degrees at your will. ​This chair from Openwheeler defines the future of chairs for gaming. It was built for luxury lounging but was also built to give you that race car chair feel. When we look for game chairs to review, we look for chairs that are stylish, lightweight and give you customization options to help you feel at ease when you’re gaming. This chair combines them all but is it worth the price? This chair out of the box will work perfectly with every console and the PC. The paintwork of the chair is made with polyester, so you won’t need to worry about paint chipping or wearing down on you. You have complete leg support with the padded sides of the base on the chair. 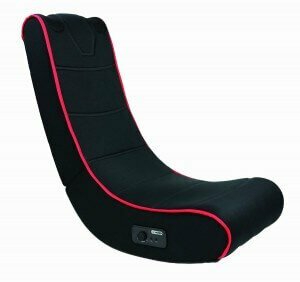 You also have back support with extra padding on the sides of the back of the chair to help you lay back and relax. There’s even a bar on the side of the chair that allows for the mounting of a gear shifter. This was made with the title “a true racing seat” which combines a lot of functionality that is found in an actual racing seat. There’s a base at the bottom of the chair that holds your feet and it’s also where you place your racing game pedals. The overall item weight of the chair isn’t too heavy so it’s not hard to move it from room to room. It only weighs 62 pounds when it’s put together and yes, there is some level of assembly required but the assembly is generally quick and it’s done in just a few simple steps. All the tools required to put the chair together are packaged together with the chair, so there are no surprises and you won’t have to purchase anything extra to enjoy the chair. 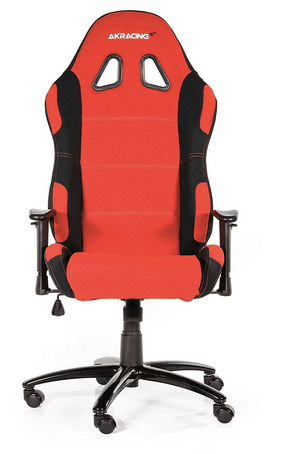 Just lean back, relax and enjoy this racing style chair. 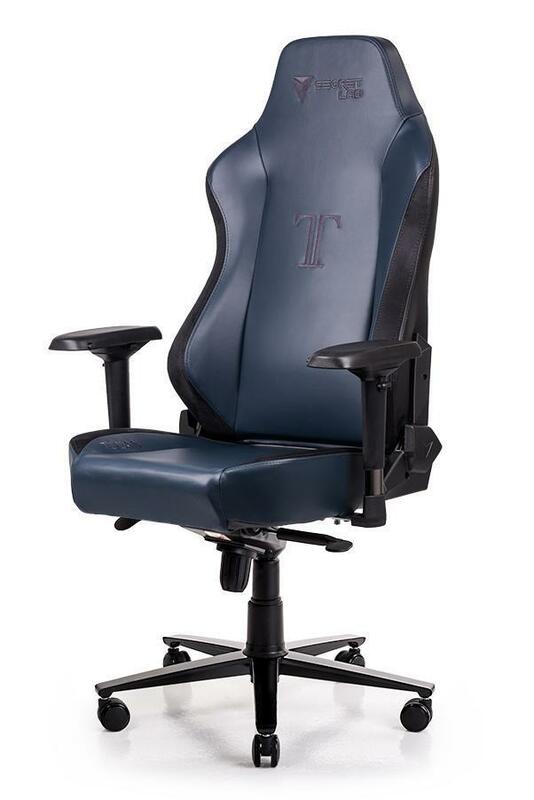 The N Seat Pro 600 Series Executive Racing Design Computer Gaming Office Swivel Chair with Lumbar Support and Headrest Pillow Included is one of the most premiere types of chair we’ve seen in the N Seat selection. When we first came across this chair, the pricing point scared us a little bit but we still wanted to give it a try and find out if the chair was worth the purchase. The very first thing we wanted to look at was the quality of the fabric and material used as this is the most important aspect. Sitting down feels really comfortable and pretty good to the touch. You don’t get uncomfortable after prolonged hours of sitting down and the assembly of the chair was very easy to do. It was done in a short few steps and all the necessary tools needed to do the assembly was provided to us. One of the best things we liked was the long lumbar padded pillow that’s also in the chair. This is great for people who like to frequently lean back in the chair and it’ll provide extra added comfort as well. The headrest pillow felt a bit tall when we looked at the image of the chair but it fits just perfectly when seated. Furmax provides highly rated ergonomic chairs for computer gaming. 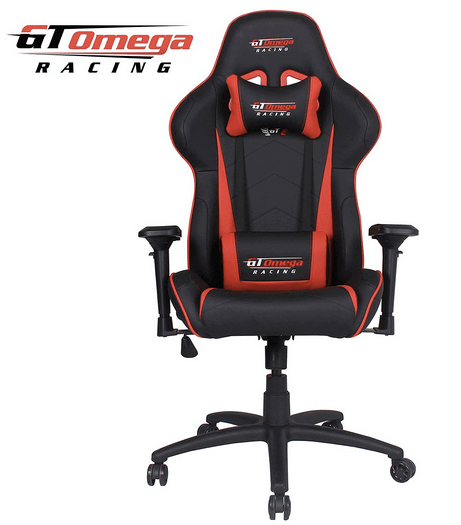 This chair is made in the popular racing style that we’ve seen with other chairs, and it provides additional lumbar support, as well. 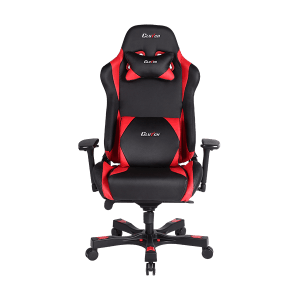 You get the comfort of armrests and neck support along with the convenience of a swivelling seat that adjusts for height, super important for staying comfortable for hours of gaming. You can get the Furmax high back PU leather game chair in one of six different colours, to complement any game room and fight the encroachment of the boring basic black office chair. The faux leather gives this chair a classy look without the worry of much upkeep. It will fit right in with your top of the line equipment. Whichever color you choose, they’re all designed to hold up to 280 pounds, accommodating most gamers. The price on this chair falls lower than other moderately priced options in quality computer chairs. We were surprised by the long-lasting comfort of this affordable chair. It’s definitely a good option for sitting in for long periods of time. 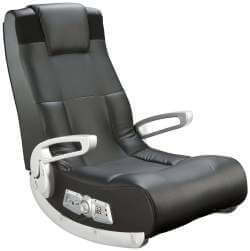 It also reclines to help you change positions and stay relaxed. Some assembly is required on this one, but overall it’s fairly easy to put together without structural concerns. And the company is good about sending replacement parts if needed. For gamers on a budget, this is the chair to choose. You’ll get decent quality and comfort with many of the features of far more expensive gaming and computer seats. 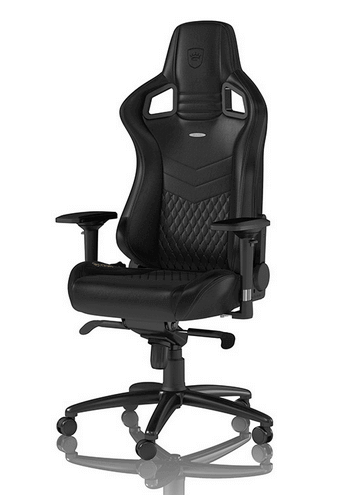 The Merax High Back Gaming Chair is another model that fits into the mid-range price options. 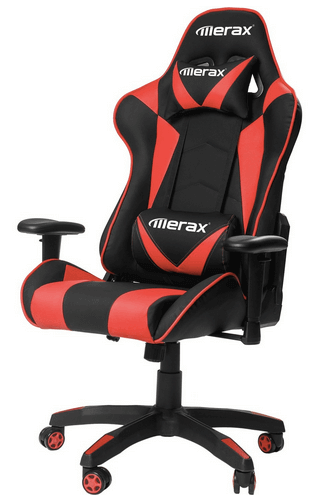 Merax has updated their design with this chair. You get the comfort of a high back style, as well as removable neck and lumbar pillows to match the faux leather chair. All the color options include classic black but add red, blue, or green detailing for a cool look for your computer and gaming room. Like other racing chairs, the Merax computer chair is height adjustable, swivels, and tilts to get you into that perfect position. It also allows you to change positions as you play so you don’t get too stiff. Not to mention, you may want to adjust the chair differently for various activities, like doing work, gaming, or watching TV. The armrests are also adjustable, and the chair features a locking back with a knob to set the locking function. This chair holds up to 250 pounds, which is about an average load capacity for racing chairs in this price range. 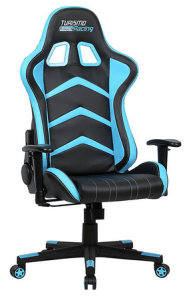 We find this chair to be very similar to the DX Racer, but at a much better price, which means more money for games and other gaming accessories. 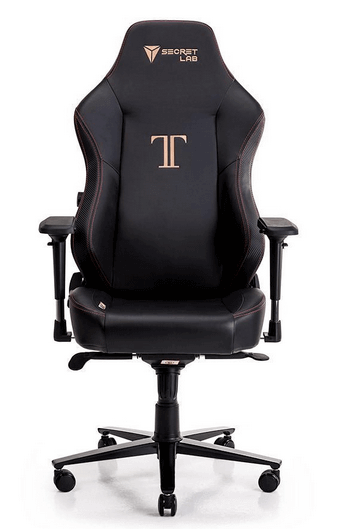 Let’s be serious, your chair is an important investment for an enjoyable computer gaming experience, but you don’t want to blow your whole budget on it. Of course, you miss a few features of the high-end racing chairs, such as the ability to move armrests back and forth (not just up and down). But the Merax chair was actually a bit easier to put together, so it balances out. 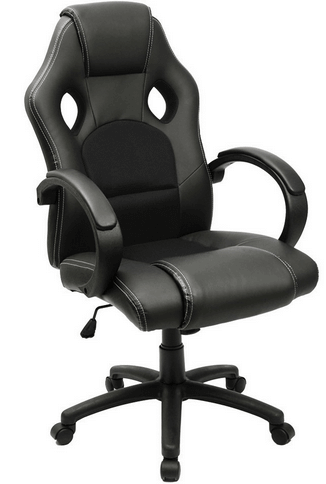 This highly-ergonomic racing chair suits all sorts of body shapes and is renowned for its comfort. The chair features a metal frame and is easy to clean due to its artificial yet realistic-looking leather. It also comes complete with a removable headrest pillow as well as a lumbar cushion. Whether you need the chair for playing games, work, study or all three, the chair shouldn’t disappoint. The chair is able to rock back and forth, and its armrest and seat height can be adjusted with ease. Able to swivel 360 degrees, the chair has a 5-point base with highly-durable casters. It has a maximum weight capacity of 330 pounds and is notable for its slick, professional style. 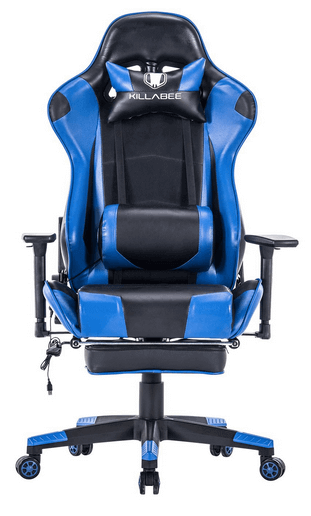 The ergonomic features of the chair make it ideal for those lengthy late-night gaming sessions, whilst the height adjustability provides your body with all the support it requires. The manufacturers have worked hard to design and manufacture a chair that delivers all-day comfort. The angle-adjustable backrest even makes it possible to safely and comfortably take a nap in the chair. The armrest is contoured to suit the shape of your arm whilst preventing repetitive stress. You can also adjust the tilt of the chair with a tension-tilt knob. The chair is available in yellow, blue and red. The item has consistently won five-star rCorsair T1 Race Gaming Chaireviews across the major retail sites. GTracing is one of the market’s most reputable brands. The X Rocker 51259 gaming chair is an ideal match for those seeking a comfortable solution for gaming, watching, reading and simply unwinding. The chair boasts four inbuilt speakers to provide Corsair T1 Race Gaming Chaira highly-immersive audio experience. It also has a dynamic sub-woofer which is built around the pioneering AFM Technology from Ace Bayou. Vibration motors are also built into the chair, and these motors sync with the bass tones so you can feel as well as hear the audio. Other features include an inbuilt radio wireless receiver and a wireless transmitter which works with any source that has RCA outputs. The package also includes optional RCA cables. Purchase the X Rocker 51259 and you’ll also be able to enjoy gun-stock arms and a padded headrest for added comfort and increased stability. The chair has found its ways into homes and offices across the world and has consistently won high ratings on the leading review sites. Maintenance is easy thanks to the vinyl seating surface, and the chair can be elevated by rails to deliver more ergonomic seating. The chair has separate controls for volume and bass as well as a stereo headphone jack. It can connect to a range of popular devices, including Xboxes, PlayStations, DVD players and home theaters. It can also be connected to multiple chairs for a first-class gaming experience and can easily be folded away to create space. The 51259 is just one of many game chairs available from the highly-reputable X Rocker brand. The Corsair T1 Race Gaming Chair looks like something you’d see in a futuristic office in a movie. It doesn’t really have that gamer feel and look but it definitely has the features that all gamers look for, if we go by the packaging. So, one thing we noticed immediately when looking at a picture of the chair, was the high and broad shoulders, which is a bit more than we see in other chairs as they try to go for a more slimming look. This could be good or bad, depending on how you look at it. So, it’s great for tall people and it has a really nice base, what else does it have to offer? The base that connects the wheels and the middle part of the chair is pretty long and we assume it’s somewhat extended in the pictures that advertise it. We also noticed that there’s an advertised 180 degree lean back tilt range which is impressive and if you really want, you could even double that up as a bed for when you’re really tired and don’t want to leave your computer. We don’t recommend doing that though, as it’s not really healthy. 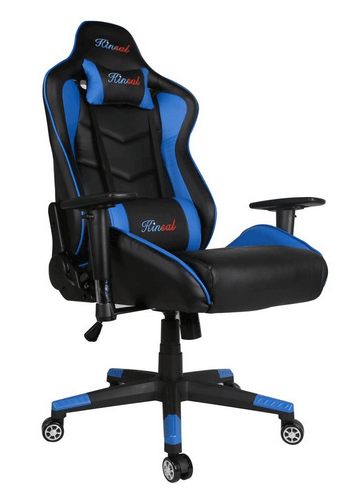 This popular BirdRock gaming chair can be adjusted into 14 different positions and is manufactured from plush memory foam. 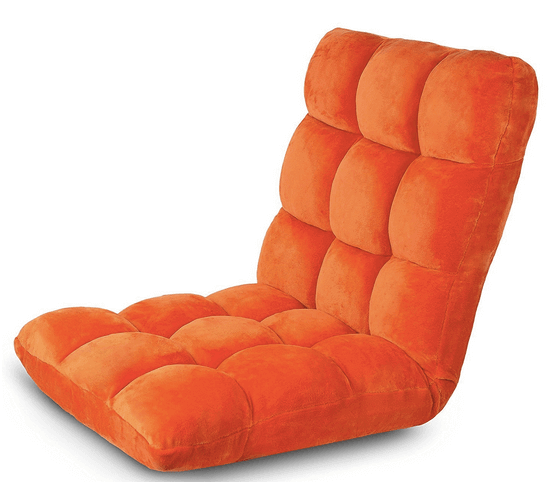 This game chair features soft fabrics on the outside, with the foam coming as a chopped blend. It is ideal for gaming, reading, watching TV and relaxing and is popular with children and adults alike. The memory foam blend provides an exceptional level of support and comfort. The chair offers quality back support for sitting on the floor and is suited to people of all heights. It has even been used in camper vans as well as homes and is noted for its easy adjustability and versatility. The product is ideal for gaming environments, bedrooms and lounges and can be stored away with ease. You can expect to derive a great deal of use from the chair before it needs to be replaced. BirdRock is a popular manufacturer that is noted for its home furniture and offers a range of products including lap desks, hampers and bamboo furniture. The manufacturer has built up a great reputation when it comes to customer support and responding to queries swiftly and welcomes you to get in touch at any point if you do have any queries about their products. More and more people across the world are investing in the BirdRock memory foam gamers floor chair. 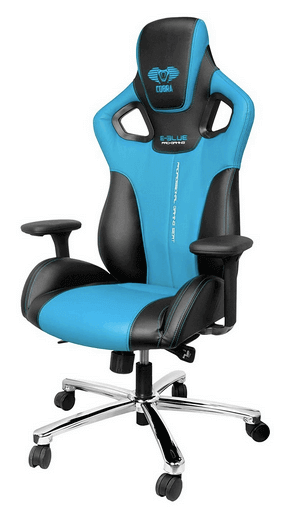 The E-Blue Auroza Gaming Lighting Chair is a chair we’re not used to seeing. It’s one of the most unique designs when it comes to design in the market. First, we have the base which is flashy aluminum coated high-grade quality. It sets apart the tone of the rest of the chair, which looks bright red or orange, depending on the angle you look at it. The armrest cushions are also pretty plump compared to quite a lot of other designs out there as well. That’s definitely one of the most interesting things about this entire chair, the overall design and what lead them to make these decisions. The base of the chair has an hour-glass like shape, which doesn’t really offer any kind of support or comfort benefit, but we like the look of it and we assume this is something that some people will either like or dislike. Comfort was made as a top priority when this chair was designed though. There’s a hump in the back for lower back support which is vital. The construction seems really solid as well, as the chair can hold up to nearly 400 pounds. The E-Blue also has a 1- year warranty if anything were to go wrong with the chair. The armrests can even rotate 360 degrees if for whatever reason you’d need to do that. When you are considering purchasing one, you need to make a decision that will support a number of criteria. What is the sole purpose of the gaming chair? Will you be using it for racing or flight simulation? Or do you plan to purchase it to play a number of games as well as for other uses, such as listening to music or watching videos? Check out the padding that is used in the seat’s design. Will it be sufficiently comfortable? How about the foam used for the chair? Is it made out of a high-quality, fire-retardant material? If you are buying a chair for your kids, is the seating safe? Will the chair encourage good posture and muscle training and development? Will you need batteries for the chair? If so, what type of batteries? What is the weight of the chair? Will it be too bulky for your needs? Or, will it fit in perfectly with your other furnishings? How about the chair’s color? Make sure you won’t tire of the chair’s hue and choose a color that can be nicely if not neutrally incorporated into your decor. What is the chair’s capacity? How much weight can the seating hold? What are the dimensions of the chair? 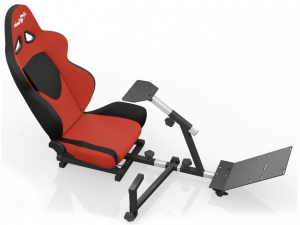 Will the seat fit in your gaming area or office? Consider a chair that fits in your gaming area and leaves enough space for you to move around. Most manufacturers specify the dimensions of each chair. Is the seat comfortable? The main reason for buying a chair for gaming is to achieve comfort when playing your favorite games. Check if the chair offers maximum support for your back and neck. Chairs with adjustable backrest and footrests are recommended. Are you getting value for your money? 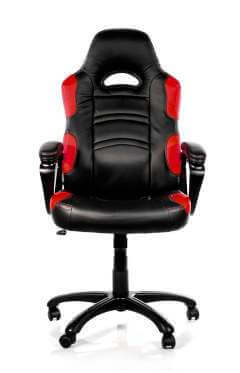 Gamer chairs have different features to suit different gaming needs. You may not need all the features provided by some chairs. Do not spend money on features that you will not need. 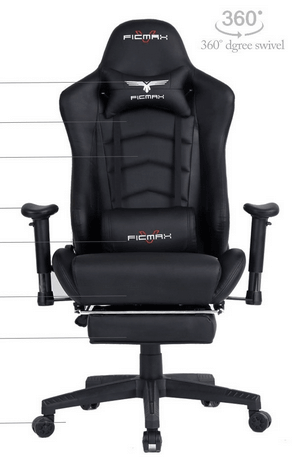 Consider the features that suit your favorite games when selecting the right chair. What material is the chair made of? Are the materials used easy to clean and maintain? Will you require any cleaning agents to keep your seat clean? Are the materials durable? What is the cost of the gamers’ chair? While cost should be among your last considerations when buying these chair, go with a chair within your budget. You can find comfortable chairs with basic features at affordable prices. How to choose the right games chair? The wide range of chair designs in the market makes choosing a gaming chair an uphill task for many buyers. The market has different designs of chairs with different features. One common misconception among buyers is that games chairs can only be used for playing video games. The intended use or purpose should guide your choice of a chair from the wide selection in the market. If you have a gaming room at home and want a chair for just playing games, consider the gaming features when buying one. The chair should be compatible with your favorite gaming console. However, if you want more than just playing games, consider chair designs that are compatible with home theaters, DVD, CD, and MP3. Some designs allow you to listen to music from your iPod and connect headphones. Another important consideration when choosing a chair design is the amount of space you have in your office or gaming room. The ideal design should fit in your space and leave enough room for you to walk around or place other items. The main reason why you are shopping for a gaming chair instead of using the couch is comfort. 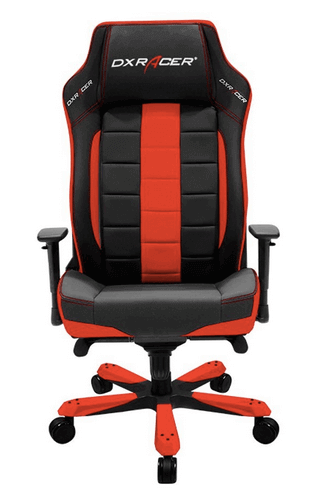 What should one look for in a gamers chair? Many of the chairs have built-in speakers but may also feature foldable arms or sub-woofers as well. 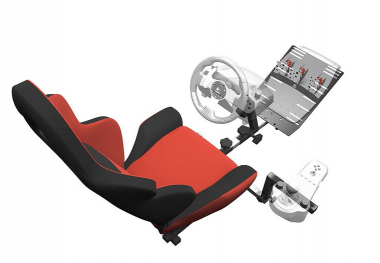 Some chairs are made solely for racing games and come with a race wheel mount and racing pedals. Other features might include a wireless feature or a stain-resistant fabric and comfortable cushioning. The chairs also are utilized with LCD and Plasma flat-screen TVs as well as a variety of stereo systems, including VHS, BETA, CD players and DVD. Gaming consoles, such as Nintendo, PlayStation, XBOX and 3DS, also complement the furnishing. Styles include rockers, bean bags, desk chairs, gyroscopic chairs and chairs with stands. Regardless of the chair’s style, the seating can be used with various kinds of computers, including iPads, tablets, notebooks, laptops, netbooks and MACs and PCs. When you’re looking for a chair for your office, for your gaming room, for a child or whatever the occasion may be, have you considered aside from comfort, how safe the chair is? It’s not a well-kept secret that gaming for hours a day or sitting in a computer chair for hours a day isn’t healthy and can lead to long-term health risks down the road. This is why companies have decided to put more support and more cushioning in their chairs, otherwise known as lumbar and head support pillows. You may have seen these on some chairs or have seen pillows attached to the chairs. Comfort is the number one benefit for adding these pillows to the chairs. They allow people to relax, not feel back pain, not get any pain in their neck or head. You’ll feel relaxed and at ease when you stand up from your chair. Blood clots are another major concern for not only health advocates but game chair manufacturers as well. It’s always recommended that you get up and stretch once in a while but you still need to have adequate cushioning on your legs, back, neck and body to make sure your blood vessels aren’t being pinched while you’re gaming, or you run the risk of forming blood clots, which can lead to serious complications. Some gamers report their overall performance in online games improving as well. When you’re more relaxed, it’s a lot easier for you to focus on the game, the sound, the environment and help dominate your opposition. If you’re worried about the cost of chairs that have lumbar and head support, don’t worry because most chair companies add them for free nowadays. If you’re looking for a serious leg up in the competition, most chairs today will come with two additional pillows that you can attach to the chair or remove based on your personal preferences. The good news is, most chairs that offer lumbar and head support are customizable so if you want to remove the pillows or slide them down a little bit, you can. These pillows sometimes come in Velcro attachments and very rarely are they stitched to the chair. Finding your perfect fit and comfort zone is priority number one when it comes to selecting the perfect chair for you. 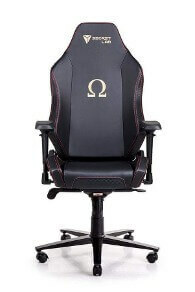 Lumbar and head support in a gaming chair should be absolutely essential when making your selection and you shouldn’t settle for any chair that doesn’t have it if you spend a lot of time gaming or sitting in a chair. 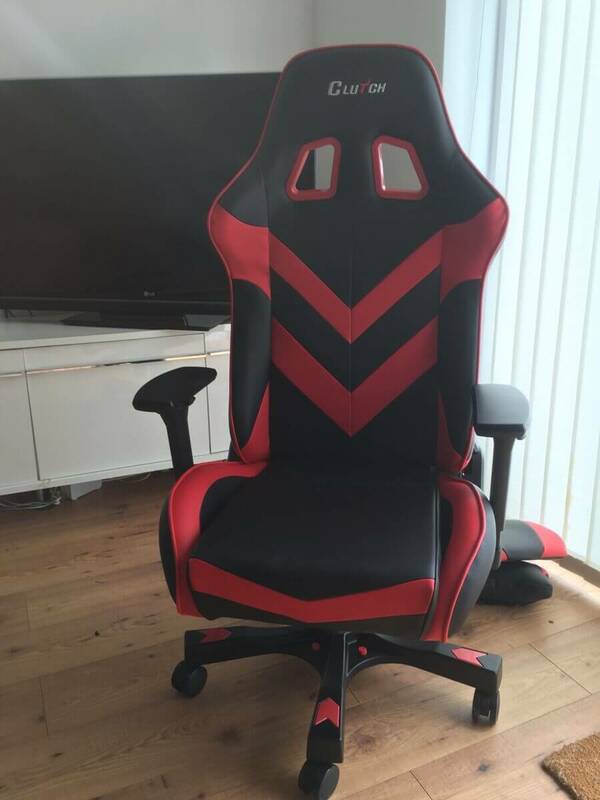 There are a large number of people who hesitate at the price of a gamers’ chair compared to an ordinary office chair and this is understandable. However, there are cheap gaming chairs out there that can start out at $20. What you may not know is that there numerous health benefits to using gaming chairs as well. Do you think you need a gamer’s chair? Have you noticed any of the following? 6)Most chairs aren’t built for comfort. This is why gaming chairs were invented. They were created to address all of the above. Sound – There are quite a few electric chairs on the market today that have subwoofers built into the headrests or the side. This can be great for people with ears that easily clog as studies have shown wearing earbuds or a headset for a majority of the day can negatively impact hearing and ear wax buildup. Back Support – This is one of the most important aspects for a variety of reasons. Most chairs for gamers come with extra soft cushioning built in for back support. Not only does this allow you to game in comfort but it’s also a necessity for people that are in a seated position for an extended period of time on a regular basis. Over time, you can develop chronic back problems if you don’t sit properly or have a properly cushioned seat. Neck Support – Most chairs aren’t tall enough nor do they offer the design capable of supporting your neck. 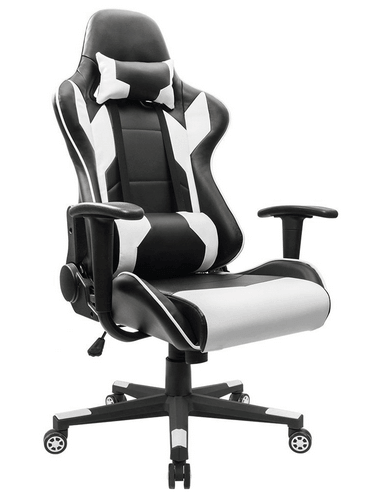 A proper gamer chair will allow you to easily rest your neck and you won’t strain your spine while you’re gaming. Holding your head up in a normal chair can cause a long list of problems if you do it over an extended period of time. Fatigue – Sitting improperly and not supporting your lumbar, neck and back can wear your body down quickly. It’s why you feel weak after a long period of gaming in a non-supportive chair. The chairs were made to address this issue and you’ll have more energy. Check the Memory Foam Seat Cushion article here for information on the best memory foam for chairs. 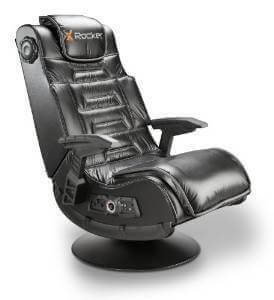 X rocker gaming chairs have an L-shaped design that allows you to lay back as you watch or play games. Rocker chairs have many features compared to other designs and very comfortable especially when fitted with the right foaming material. The chairs are fixed on the ground and their designs allow to rock as you watch. Some have inbuilt tilts and swivels that allow you to adjust the chair until you get the most comfortable posture. The design is ideal if you play games or watch TV in your living room or theatre room at home. You can do more than play a game on a gamer chair. Pedestal gaming chairs are elevated above the ground and allow you to shift from working to playing games. The design is ideal if you play games on your computer or if your TV is elevated a good height above the ground. You can view the screen of your computer or TV directly when sitting on a pedestal chair. Rocker chairs are a bit uncomfortable for older and taller gamers. Pedestal chairs are ideal for such gamers because they can sit and rise without experiencing any pain on their knees and back. Computer game chairs have fewer features than most rockers chairs. However, some have ergonomic designs with in-built sound systems and RCA cables. Some designs have speakers and sub-woofers that enable you to listen to music as you work or play games. The advantage of using a pedestal chair in your office is that it protects you from back pains and eye strains associated with most office seats. In addition, most of these chairs are adjustable to fit different postures. You can lay back and take a nap comfortably on a pedestal chair. 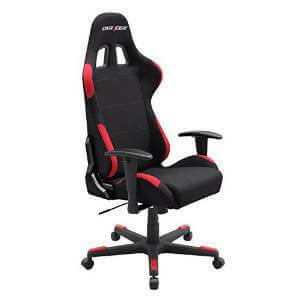 Racing chairs are specifically designed for racing games. The gaming seats have steering wheels and pedals that give you nearly the same experience of driving a car. You can brake and accelerate with the in-built pedals and use the shifter to change gears. Like other game chairs, these chair designs have adjustability features. You can adjust the driving seat to the most comfortable position. 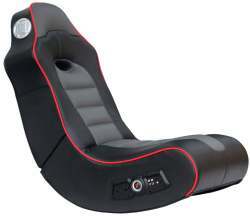 Racing chairs are compatible with all game consoles and hence you are not limited to racing games. These chairs as the name suggests are made of firm but comfortable foam. The chairs are designed for kids. Kids require a comfortable posture when playing games as well. If you are fond of playing games with your kids, foam chairs are your best buy for their comfort. Kids do not require the extra features that come with rocker and pedestal chairs. Bean-bag chairs are also designed for kids. The chairs are made of polystyrene beans. One advantage of bean-bag chairs over memory foam chairs is that they are easy to fold and store. Bean bag chairs are water and resistant and have beautiful colours that kids find attractive. Bean-bag game chairs can sustain more pressure than memory foam chairs depending on the foam used. ​Read here about the details on the Adult bean bag chairs. Coming in at the top of the list is Atlantic's Gaming Desk Pro. This desk provides an answer to those looking for a highly functional gaming desk with low spacial impact. Jammed full of features the Gaming Desk Pro takes up a meek 52” x 25.25” inch area while maintaining great organizational features. For such a small desk the Gaming Desk Pro sports a myriad features that help keep it organized, including a storage drawer, smartphone or tablet charging station, storage space for a laptop, two console control stands, speaker stands, a headphone stand, and a nifty wire management system. The desk also claims the capability of supporting a flat screen monitor up to 32 inches and a maximum weight of 40 pounds. All in all if you have a reasonably light monitor and some IKEA grade patients this desk is a great buy. 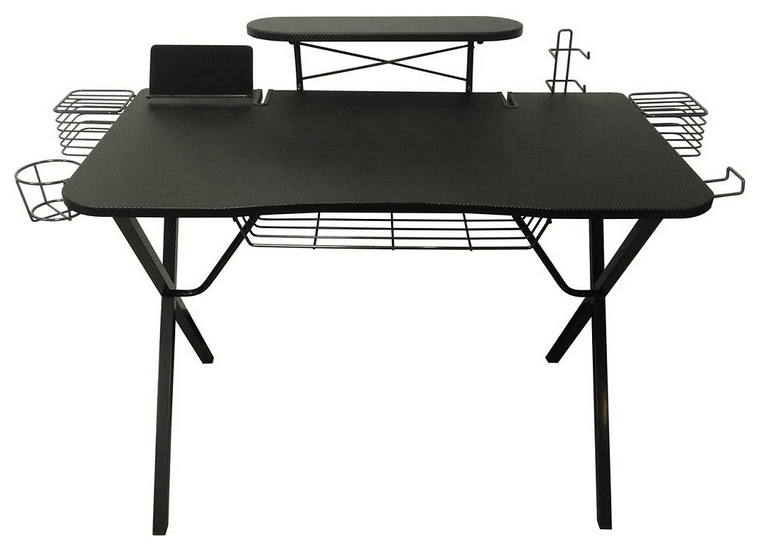 The modular design allows for you to set up your desk the way you want it and the build quality is quite good. The range of optional features allow for the user to keep the desk organized and clean, which lends to a long held belief by gamers; A clean and well organized gaming desk will create a clean and organized mind, allowing for one hundred percent focus on the game. It really helps, if you don't believe try it! When it comes to gaming mice, Logitech is top dog and the G502 Proteus Spectrum is no exception. Jammed in with some top end features the 502 also comes in at a top end price. If money is no issue and your looking for the best, Logitech should always be on your radar and the G502 is their flagship gaming mouse! The G502 sports the most intense optical sensor Logitech has produced to date. Which in many ways is unnecessary as the sensor can read and intemperate movements at much higher speeds than any human ability can make use of. Evidenced by the fact that the mouse can be adjusted from a meager 200 DPI to a baffling and totally unusable 12,000. The 502 features 11 programmable buttons, most of which manage to stay out of the way when gaming hard. These buttons are assigned using Logitech's gaming software which is awesome and also allows you to adjust the full RGB lighting housed behind the transparent Logitech logo. The mouse is ergonomically designed and is extremely comfortable in the hand. 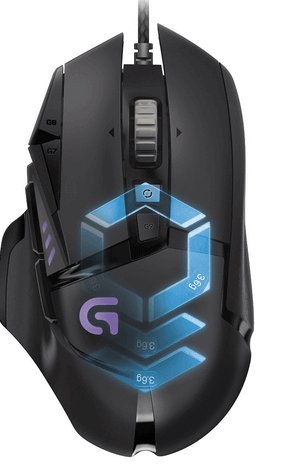 Lastly and perhaps one of the most useful features of all to the gamer, the G502 has a small amount of on board memory that allows it to save your settings TO THE MOUSE. This means when swapping computers there is no fiddling with settings the mouse takes care of it all. Altogether the offerings of the Logitch G502 are astounding. This mouse is quite possibly the next MX-500 (sorry for the out dated reference kids) and most of its downsides are easily worked around or gotten used to. If your ready to drop the dough and looking for the best the 502 might be for you! Yet another Chroma enabled device from Razer, The BlackWidow RGB mechanical keyboard is a top of the line peripheral for the rave gamer. This keyboard will do everything you need a keyboard to do all while looking badass. The BlackWidow Chroma features Razer's green mechanical switches which are rated for 80 million clicks and feel extremely rewarding to push. The caps are plastic, but feel good and don't seem to wear quickly. It features 5 programmable macro keys on the left side that can be programmed using Razer's Synapse software. The keyboard though made entirely of plastic feels pretty durable and doesn't creak. Finally it features Razer's 16.8 million customizable Chroma lighting. Allowing users to change the color of any key and of course sync up with any other Chroma devices. The cons for the BlackWidow are are marginal, but for a product of this price they need to be mentioned. As with most mechanical keyboards, the key clicks are loud. The fonts used on the keys varies from key to key and can be very hard to read. The labeling on the shift keys is gray and is not illuminated from below which makes them also very difficult to read.. Worst of all several of the punctuation keys ( ; ' / . , ) have been swapped around from that a traditional QWERTY layout so the one normally requiring shift no longer does. For example on a normal layout to type a question mark your required to hold shift, on this keyboard holding shift would net you a slash and no shift would make a question mark. To top it all off the whole thing is a fingerprint magnet. If you've got the cash to fork over to Razer the Blackwidow Chroma is a pretty awesome buy. It does everything a gamer could wish and then some. The minor downsides can easily be overlooked when the blinding Chroma LEDs are shining back in your face. Seriously this is actually a pretty cool application for LEDs, being able to light up just W, A, S, and D at night time would be nice benefit to gamers. 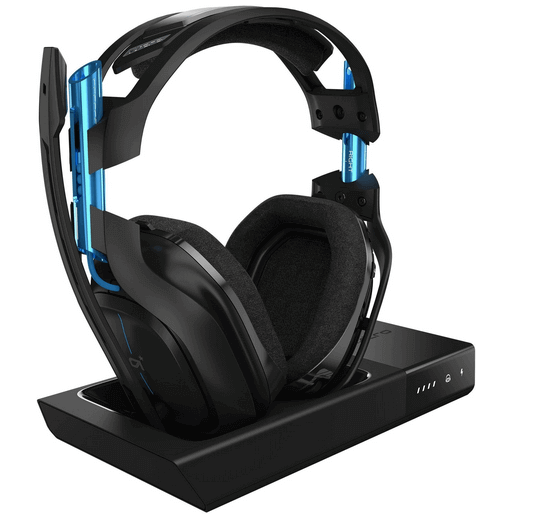 The A50 Wireless headset from ASTRO is pretty much the top of the line when it comes to wireless gaming headsets. They boast quite an array of features, the downsides are minimal, and this is very clearly reflected in the cost. The A50's interface through a 3.5mm aux jack that is connected to its charging stand that also doubles as it's wireless transmitter, capable of transmitting lag-free audio over a 5GHz wireless network. They are constructed primarily of plastic, but feature alloy posts that run between the headband and ear cups, and make for a very solid and sturdy feeling headset. The foam in the ear cups is very soft, it's wrapped in a faux-leather that helps trap the acoustics, this faux-leather is then covered in a very soft and breathable fabric making them an incredibly cool and comfortable headset even during extremely long gaming sessions. They contain a set of 40mm neodymium magnet drivers that produce an awesome sound over the entire range. As a whole this is an awesome gaming headset at and aw striking price, but this is the no budget list so why not? Not only does this headset do everything a headset needs to do, its wireless, comfortable, light, and will look pretty cool sitting on your desk. Even having the few issues it does if your looking to spend some cash the ASTRO A50's won't let you down. When it comes to monitors there is a lot to consider. When it comes to gaming monitors there is only a few things that make a difference, that's where the ASUS VG248QE comes. Sporting just about every top of the line feature a gamer could ask for, save for 4k! Jammed packed with all the necessaries the VG248QE is a game changer. Most game changing of all is having a 144Hz refresh rate. despite what the haters say it does make a difference when gaming. With a 1ms response time and low to no ghosting this monitor is a pleasure to game on for eyes and really helps to keep down on eye strain. It also comes ready to work with g-sync which many gamers will be thankful for. It's held up by an ergonomically designed stand that tilts, swivels, pivots, and allow for height adjustments for the perfect viewing angel, as well as has wall mounting capabilities. It has two 2 watt stereo speakers, but who cares. More importantly it can interfaces through DisplayPort, Dual-link DVI-D, and HDMI ports for multi device connections. The hole thing feels high quality and like it will be around for a while, and looks great. With our comprehensive buying guide, we've outlined the most important factors to consider when selecting a gaming chair for your gaming endeavors. The fact is, the chair you choose is likely to have an effect on your overall experience. It's worth getting one that suits your needs, and there's plenty to set them apart. Many gamers are willing to spend any amount of money for the best gaming system but are reluctant to spend as much on gaming chairs. Some are unaware of the gaming solutions in the market. The right chair is worth every penny. You will not understand how sitting on the right gaming chair improves your gaming experience until you sit on one. Our aim is to help you select the best one for gaming that suits your needs. If you have never bought a gamers’ chair or need to upgrade your chair, you have come to the right place. We do not sell them oursleves but list the best products on the market to help you identify the best chair fast. Marketing messages and promises from manufacturers may confuse a new buyer. 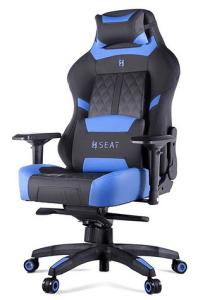 We review the manufacturer’s specifications and consider other customers’ experiences when recommending gaming chairs and accessories to potential readers. Remember to consider the comfort, purpose, weight, colour and capacity before making your choice. Each could make or break it's usability in the long-term. Whatever you go for, style and design are also important. You can choose from bean bags, rockers, gyroscopic and desk chairs among others. They all have different pros and cons, but there should be one that catches your eye. 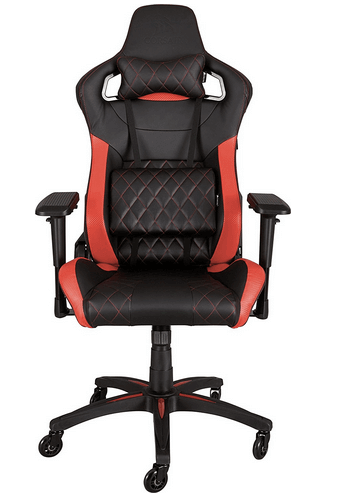 Gamer chairs differ in their features, accessories, and designs. A number are built for specific genres (such as racing), while others plan to get your attention with additional perks. These vary from health benefits to inbuilt speakers. Some chairs feel a bit gimmicky, and others don't offer enough protection for prolonged use. Don't get a chair just because it looks good, and be sure to check reviews first. Pricing is important. Cheaper chairs often lack features like extra padding and ergonomic support, so it's sometimes better to wait until you can afford a nicer one. The chairs listed above are some of the best available on the market, but they will set you back a fair amount (that's why it pays to choose a manufacturer that offers decent warranty options). If you do splash out, you're probably going to like your new chair, no matter which you decide on in the end. Regardless, there's always a chance that one of the others could make you happier still. Hopefully, you should now have a better understanding of what to look for when purchasing a new chair. It's often a tough choice, but you're now armed with all of the information you need to make an informed purchase. We also have a variety of in-depth reviews of the best games seating available on the market. Click here to take a look at the latest that we've managed to get our hands on.